A few months ago, I was walking on the beautiful beaches of Gulf Shores, Alabama, with my husband. We had had a long day playing and decided to take a leisurely stroll as the sun began to set. All around us, giggling children ran around with buckets trying to catch hermit crabs. It was an idealistic moment, one of those times each year that fortifies one until one can get back to the sound and the feel of the ocean or the mountains or the plains. As we walked, Bob occasionally stopped and looked out towards the ocean. He is a person prone to quiet contemplation, so I choose not to disturb him. But each time he paused, it forced me to pause. Amid our romantic and serene surroundings, I found myself torn between stopping for him and walking on for me. I started to become agitated. So, walk on I did. After a few minutes, I looked back. The sun had set and night had closed in on the beach. I had lost my love. It occurred to me that night that relationships in recovery are often like that fateful walk on the beach. Two people may meet at the same place. They might start walking in the same direction at the same pace, but eventually, one of them is going to take a pause. Maybe life has become too busy or meetings no longer hold the same appeal. Maybe one of the partners has disengaged from their sponsor. When that happens, when one lags behind spiritually, the other partner is then forced into making a decision. Either the partner also lags, or else they move forward, going out to meetings, staying accountable to their recovery, and risking outgrowing their partner. I don’t really have an answer. 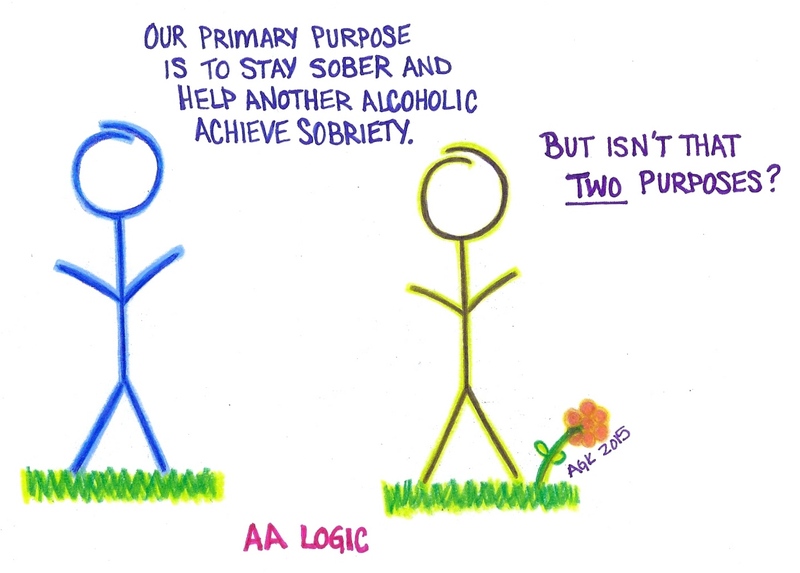 What I do know is “We feel a man is unthinking when he says that sobriety is enough” (Big Book 82), and “More sobriety brought about by the admission of alcoholism and by the attendance at a few meetings is a very good indeed, but it is bound to be a far cry from permanent sobriety and a contented, useful life… Nothing short of continuous action upon these as a way of life can bring the much-desired results” (Twelve and Twelve 39-40). So, I ask of you, the readers. How do you traverse this minefield of relationshipal disasterness? How do you keep accountable to each other without being enmeshed in each other’s program? If water finds its own level, how do you keep in homeostasis? If you have any thoughts on what works ( or what doesn’t work), we would love to hear your comments. You can post anonymously on WordPress, or you can email and I will copy and paste your comment onto the blog without your name. We look forward to hearing from you. Yes, there is a substitute and it is vastly more than that. It is a fellowship in Alcoholics Anonymous. There you will find release from care, boredom and worry. Your imagination will be fired. Life will mean something at last. The most satisfactory years of your existence lie ahead. Thus we find the fellowship, and so will you (Big Book 152). Well, hello there. Some of you have read my blog before, but for those who have not, allow me a moment to introduce myself. My name is Ann Kroger. I live a bit north of Houston, Texas. I have been sober for nine years, and writing this blog for the last two. A few months ago, amid a flurry of activity and sober living, I realized I needed a breather from the self-imposed stress of deadlines. But now, the click-clacking of the keyboard is beckoning me. I am ready to return with a newer and more exciting version of my old blog. This time, I am inviting both strangers and friends to submit their own posts and writings. Recovery is, after all, a “we” thing, and I am tired of my own voice. Posts will come out on Tuesdays. This time, I hope to spark more conversation and commentary. If it is your anonymity keeping you from contributing your opinions, you can create an anonymous name on WordPress. If you want to write a post or ask a question of me personally, I urge you to email me. I am a real person. I will read your emails and answer them. Anywho, I hope you are all doing well. Talk to you soon!